^ Hermann, Andreas; Hoffmann, Roald; Ashcroft, N. W. Condensed Astatine: Monatomic and Metallic. Physical Review Letters. 2013, 111 (11). doi:10.1103/PhysRevLett.111.116404. ^ 2.0 2.1 Bonchev, Danail; Kamenska, Verginia. Predicting the properties of the 113–120 transactinide elements. The Journal of Physical Chemistry (ACS Publications). 1981, 85 (9): 1177–86. doi:10.1021/j150609a021. ^ Rothe, S.; Andreyev, A. N.; Antalic, S.; Borschevsky, A.; Capponi, L.; Cocolios, T. E.; De Witte, H.; Eliav, E.; 等. Measurement of the first ionization potential of astatine by laser ionization spectroscopy. Nature Communications. 2013, 4: 1835–. PMC 3674244. PMID 23673620. doi:10.1038/ncomms2819. ^ Price, Andy (2004-12-20). "Francium". Retrieved 2012-02-19. ^ 5.0 5.1 Hollerman, Arnold. Inorganic Chemistry. Berlin: Academic Press. 2001: 423. ISBN 0123526515. ^ 6.00 6.01 6.02 6.03 6.04 6.05 6.06 6.07 6.08 6.09 6.10 6.11 Audi, G.; Wapstra, A. H.; Thibault, C.; Blachot, J.; Bersillon, O. The NUBASE evaluation of nuclear and decay properties (PDF). Nuclear Physics A. 2003, 729: 3–128. Bibcode:2003NuPhA.729....3A. doi:10.1016/j.nuclphysa.2003.11.001. （原始内容 (PDF)存档于2008-09-23）. ^ Greenwood, Norman Neill; Earnshaw, Alan. Chemistry of the elements 2nd. Butterworth-Heinemann. 2002: 855. ISBN 0-7506-3365-4. ^ 8.0 8.1 8.2 8.3 8.4 8.5 Wiberg, Egon; Wiberg, Nils; Holleman, Arnold Frederick. Inorganic Chemistry. John Wiley and Sons. 2001: 423. ISBN 978-0-12-352651-9. ^ 9.0 9.1 9.2 9.3 Emsley, John. Nature's Building Blocks: An A-Z Guide to the Elements New. New York, NY: Oxford University Press. 2011: 57–58. ISBN 978-0-19-960563-7. ^ Kotz, John C.; Treichel, Paul M.; Townsend, John. Chemistry & Chemical Reactivity 8. Cengage Learning. 2011: 65. ISBN 978-0-8400-4828-8. ^ Jahn, Thomas P. MIPS and their role in the exchange of metalloids. Advances in Experimental Biology and Medicine 679. Springer. 2010: 41. ISBN 978-1-4419-6314-7. ^ Siekierski, Slawomir; Burgess, John. Concise chemistry of the elements. Horwood. 2002: 65, 122. ISBN 978-1-898563-71-6. ^ Maddock, A. G. Astatine. Supplement to Mellor's comprehensive treatise on inorganic and theoretical chemistry, Supplement II, Part 1, (F, Cl, Br, I, At). 1956: 1064‒1079. ^ Garrett, Alfred Benjamin; Richardson, John B.; Kiefer, A. S. Chemistry: A first course in modern chemistry. Ginn. 1961: 313. ^ Seaborg, Glenn T. Transuranium element. Encyclopædia Britannica's guide to the Nobel prizes. 2012. ^ Oon, Hock Leong. Chemistry Expression: An Inquiry Approach. 'O' Level Special/Express [Textbook]. John Wiley and Sons. 2007: 300. ISBN 978-981-271-162-5. ^ Hansen, Per Freiesleben. Jensen, Ole Mejlhede, 编. The Science of Construction Materials. Springer. 2009: B.2. ISBN 978-3-540-70897-1. ^ 18.0 18.1 Otozai, K.; Takahashi, N. Estimation chemical form boiling point elementary astatine by radio gas chromatography. Radiochimica Acta. 1982, 31 (3‒4): 201‒203. ^ Lavrukhina & Pozdnyakov 1966, p. 253. ^ Donohue, Jerry. The structures of the elements. Robert E. Krieger. 1982: 400. ISBN 978-0-89874-230-5. ^ Merinis, J.; Legoux, G.; Bouissières, G. Etude de la formation en phase gazeuse de composés interhalogénés d'astate par thermochromatographie [Study of the gas-phase formation of interhalogen compounds of astatine by thermochromatography]. Radiochemical and Radioanalytical Letters. 1972, 11 (1): 59–64 （法语）. ^ Takahashi, N.; Otozai, K. The mechanism of the reaction of elementary astatine with organic solvents. Journal of Radioanalytical and Nuclear Chemistry. 1986, 103: 1‒9. doi:10.1007/BF02165358. ^ Takahashi, N.; Yano, D.; Baba, H. Chemical behavior of astatine molecules. Proceedings of the international conference on evolution in beam applications, Takasaki, Japan, November 5‒8, 1991: 536‒539. 1992. ^ Zuckerman & Hagen 1989, pp. 21–22 (21). ^ Kugler & Keller 1985, pp. 110, 116, 210–211, 224. ^ Meyers, Robert Allen. Halogen chemistry. Encyclopedia of physical science and technology 3rd. Academic Press: 197–222 (202). 2001. ISBN 978-0-12-227410-7. ^ Keller, Cornelius; Wolf, Walter; Shani, Jashovam. Radionuclides, 2. Radioactive Elements and Artificial Radionuclides. Ullmann's Encyclopedia of Industrial Chemistry. Ullmann's Encyclopedia of Industrial Chemistry 31: 89–117 (96). 2011. ISBN 3-527-30673-0. doi:10.1002/14356007.o22_o15. ^ Zumdahl, Stephen S.; Zumdahl, Susan A. Chemistry 8th. Cengage Learning. 2008: 56. ISBN 0-547-12532-1. ^ 29.0 29.1 Housecroft, Catherine E.; Sharpe, Alan G. Inorganic chemistry 3rd. Pearson Education. 2008: 533. ISBN 978-0-13-175553-6. ^ Kugler & Keller 1985, p. 116. ^ Smith, A.; Ehret, W. F. College chemistry. Appleton-Century-Crofts. 1960: 457. ^ Milanov, M.; Doberenz, V.; Khalkin, V. A.; Marinov, A. Chemical properties of positive singly charged astatine ion in aqueous solution. Journal of Radioanalytical and Nuclear Chemistry. 1984, 83 (2): 291–299. doi:10.1007/BF02037143. ^ 33.0 33.1 33.2 Lavrukhina & Pozdnyakov 1966, p. 235. ^ Dolg, M.; Kuchle, W.; Stoll, H.; Preuss, H.; Schwerdtfeger, P. Ab Initio pseudopotentials for Hg to Rn: II. Molecular calculations on the hydrides of Hg to At and the fluorides of Rn. Molecular Physics. 1991, 74 (6): 1265–1285 (1265, 1270, 1282). Bibcode:1991MolPh..74.1265D. doi:10.1080/00268979100102951. ^ Saue, T.; Faegir, K.; Gropen, O. Relativistic effects on the bonding of heavy and superheavy hydrogen halides. Chemical Physics Letters. 1996, 263 (3–4): 360–366 (361–362). Bibcode:1996CPL...263..360S. doi:10.1016/S0009-2614(96)01250-X. ^ Barysz, Maria. Relativistic Methods for Chemists. Springer. 2010: 79. ISBN 978-1-4020-9974-8. ^ Thayer, John S. Relativistic effects and the chemistry of the heaviest main-group elements. Journal pf Chemical Education. 2005, 82 (11): 1721–1727 (1725). Bibcode:2005JChEd..82.1721T. doi:10.1021/ed082p1721. ^ Winter, Mark J. Electronegativity (Allred-Rochow): periodicity. WebElements. [8 April 2012]. ^ Smith, Derek William. Inorganic Substances: A Prelude to the Study of Descriptive Inorganic Chemistry. Cambridge Texts in Chemistry and Biochemistry. Cambridge University Press. 1990: 135. ISBN 0-521-33738-0. ^ Anders, E. Technetium and astatine chemistry. Annual Review of Nuclear Science. 1959, 9: 203–220. Bibcode:1959ARNPS...9..203A. doi:10.1146/annurev.ns.09.120159.001223. ^ 41.0 41.1 41.2 41.3 Nefedov, V. D.; Norseev, Yu. V.; Toropova, M. A.; Khalkin, Vladimir A. Astatine. Russian Chemical Reviews. 1968, 37 (2): 87–98. Bibcode:1968RuCRv..37...87N. doi:10.1070/RC1968v037n02ABEH001603. ^ Aten, Jun., A. H. W.; Doorgeest, T.; Hollstein, U.; Moeken, H. P. Section 5: radiochemical methods. Analytical chemistry of astatine. Analyst. 1952, 77 (920): 774–777. Bibcode:1952Ana....77..774A. doi:10.1039/AN9527700774. ^ 43.0 43.1 43.2 43.3 43.4 43.5 Zuckerman & Hagen 1989, p. 31. ^ 44.0 44.1 Zuckerman & Hagen 1989, p. 38. ^ Kugler & Keller 1985, p. 211. ^ Kugler & Keller 1985, pp. 109–110, 129, 213. ^ Kugler & Keller 1985, pp. 214–218. ^ Appelman, E. H.; Sloth, E. N.; Studier, M. H. Observation of astatine compounds by time-of-flight mass spectrometry. Inorganic chemistry. 1966, 5 (5): 766–769. doi:10.1021/ic50039a016. ^ Pitzer, K. S. Fluorides of radon and element 118. Journal of the Chemical Society, Chemical Communications. 1975, 5 (5): 760b–761. doi:10.1039/C3975000760B. ^ 50.0 50.1 Kugler & Keller 1985, pp. 112, 192–193. ^ Kugler & Keller 1985, p. 111. ^ Kugler & Keller 1985, p. 222. ^ 53.0 53.1 53.2 Zuckerman & Hagen 1989, pp. 190–191. ^ Kugler & Keller 1985, p. 219. ^ Zuckerman & Hagen 1989, pp. 192–193. ^ Zuckerman & Hagen 1989, p. 276. ^ Davidson, Matthew. Contemporary boron chemistry. Royal Society of Chemistry. 2000: 146. ISBN 978-0-85404-835-9. ^ Ball, Philip. The Ingredients: A Guided Tour of the Elements. Oxford University Press. 2002: 100–102. ISBN 978-0-19-284100-1. ^ Lavrukhina & Pozdnyakov 1966, p. 226. ^ Allison, Fred; Murphy, Edgar J; Bishop, Edna R.; Sommer, Anna L. Evidence of the detection of element 85 in certain substances. Physical Reviews. 1931, 37 (9): 1178–1180. Bibcode:1931PhRv...37.1178A. doi:10.1103/PhysRev.37.1178. ^ Alabamine & Virginium. Time Magazine (Time). 15 February 1932 [10 July 2008]. ^ Trimble, R. F. What happened to alabamine, virginium, and illinium?. Journal of Chemical Education. 1975, 52 (9): 585. Bibcode:1975JChEd..52..585T. doi:10.1021/ed052p585. ^ MacPherson, H. G. An investigation of the magneto-optic method of chemical analysis. Physical Review (American Physical Society). 1934, 47 (4): 310–315. Bibcode:1935PhRv...47..310M. doi:10.1103/PhysRev.47.310. ^ Mellor, Joseph William. A comprehensive treatise on inorganic and theoretical chemistry. Longmans, Green. 1965: 1066. OCLC 13842122. ^ Karlik, Berta; Bernert, Traude. Über eine vermutete β-Strahlung des Radium A und die natürliche Existenz des Elementes 85 [About a suspected β-radiation of radium A, and the natural existence of the element 85]. Naturwissenschaften. 1942, 30 (44–45): 685–686. Bibcode:1942NW.....30..685K. doi:10.1007/BF01487965 （德语）. ^ Leigh-Smith, Alice; Minder, Walter. Experimental evidence of the existence of element 85 in the thorium family. Nature. 1942, 150 (3817): 767–768. Bibcode:1942Natur.150..767L. doi:10.1038/150767a0. ^ 69.0 69.1 Corson, Dale R.; MacKenzie, Kenneth Ross; Segrè, Emilio. Artificially radioactive element 85. Physical Review (American Physical Society). 1940, 58 (8): 672–678. Bibcode:1940PhRv...58..672C. doi:10.1103/PhysRev.58.672. ^ Karlik, Berta; Bernert, Traude. Eine neue natürliche α-Strahlung [A new natural α-radiation]. Naturwissenschaften. 1943, 31 (25–26): 298–299. Bibcode:1943NW.....31..298K. doi:10.1007/BF01475613 （德语）. ^ Karlik, Berta; Bernert, Trande. Das Element 85 in den natürlichen Zerfallsreihen [The element 85 in the natural decay chains]. Zeitschrift für Physik. 1943, 123 (1–2): 51–72. Bibcode:1943ZPhy..123...51K. doi:10.1007/BF01375144 （德语）. ^ Lederer, Charles Michael; Hollander, Jack M.; Perlman, Isadore. Table of Isotopes Sixth. New York: John Wiley & Sons. 1967: 1–657. ^ 73.0 73.1 73.2 73.3 Lavrukhina & Pozdnyakov 1966, p. 232. ^ Rankama, Kalervo. Isotope geology 2nd. Pergamon Press. 1956: 403. ISBN 978-0-470-70800-2. ^ 75.0 75.1 Lavrukhina & Pozdnyakov 1966, p. 231. ^ 76.0 76.1 76.2 Lehto, Jukka; Hou, Xiaolin. Chemistry and Analysis of Radionuclides: Laboratory Techniques and Methodology. Wiley-VCH. 2011: 2–3. ISBN 978-3-527-32658-7. ^ Lavrukhina & Pozdnyakov 1966, p. 230. ^ Asimov, Isaac. Only a Trillion. Abelard-Schuman. 1957: 24. ^ Emeléus, Harry Julius. Advances in inorganic chemistry 31. Academic Press. 1987: 43. ISBN 978-0-12-023631-2. ^ Barton, G. W.; Ghiorso, Albert; Perlman, I. 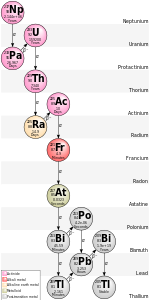 Radioactivity of astatine isotopes. Physical Reviews. 1951, 82 (1): 13–19. Bibcode:1951PhRv...82...13B. doi:10.1103/PhysRev.82.13. ^ Russell, Pamela Joan; Jackson, Paul; Kingsley, Elizabeth Anne. Prostate Cancer Methods and Protocols. Humana Press. 1989: 335. ISBN 978-0-89603-978-0. ^ Krebs, Robert E. The History and Use of Our Earth's Chemical Elements: A Reference Guide 2nd. Greenwood Publishing Group. 2006: 257–259. ISBN 978-0-313-33438-2. ^ 83.0 83.1 83.2 83.3 83.4 83.5 Lavrukhina & Pozdnyakov 1966, p. 234. ^ Gopalan, R. Inorganic Chemistry for Undergraduates. Universities Press. 2009: 547. ISBN 978-81-7371-660-7. ^ Stigbrand, Torgny; Carlsson, Jorgen; Adams, Gregory P. Targeted Radionuclide Tumor Therapy: Biological Aspects. Springer. 2008: 150. ISBN 978-1-4020-8695-3. ^ 86.0 86.1 86.2 86.3 86.4 Lavrukhina & Pozdnyakov 1966, p. 254. ^ 87.0 87.1 87.2 Vértes, Attila; Nagy, Sándor; Klencsár, Zoltán. Handbook of Nuclear Chemistry 4. Springer. 2003: 337. ISBN 978-1-4020-1316-4. ^ 88.0 88.1 Cobb, L. M.; Harrison, A.; Butler, S. A. Toxicity of Astatine-211 in the Mouse. Human & Experimental Toxicology. November 1988, 7 (6): 529–534. doi:10.1177/096032718800700602. Kugler, H. K.; Keller, C. 'At, Astatine', system no. 8a. Gmelin handbook of inorganic and organometallic chemistry 8 8th. Springer-Verlag. 1985. ISBN 3-540-93516-9. Lavrukhina, A. K.; Pozdnyakov, A. A. Аналитическая химия технеция, прометия, астатина и франция [Analytical Chemistry of Technetium, Promethium, Astatine, and Francium]. Nauka. 1966 （俄语）. Zuckerman, J. J.; Hagen, A. P. Inorganic Reactions and Methods, the Formation of Bonds to Halogens. John Wiley & Sons. 1989. ISBN 978-0-471-18656-4.